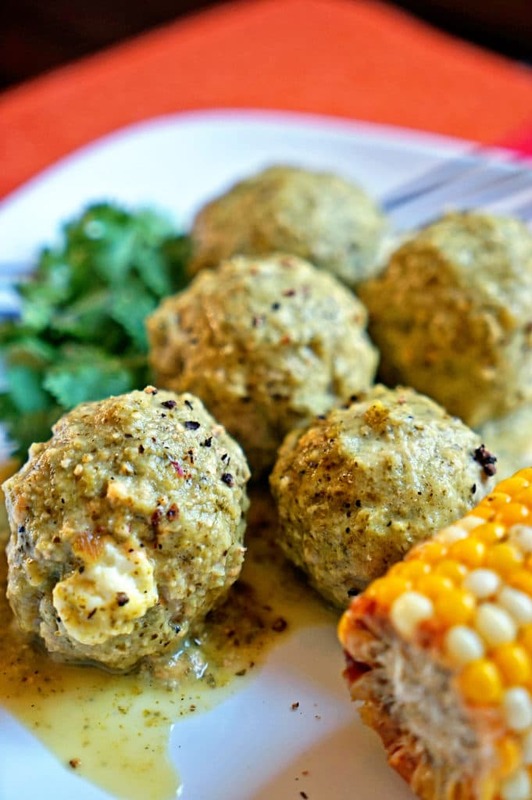 These baked, pepper jack cheese Stuffed Green Chile Meatballs are made with ground turkey, ground oats instead of breadcrumbs and a tomatillo sauce. 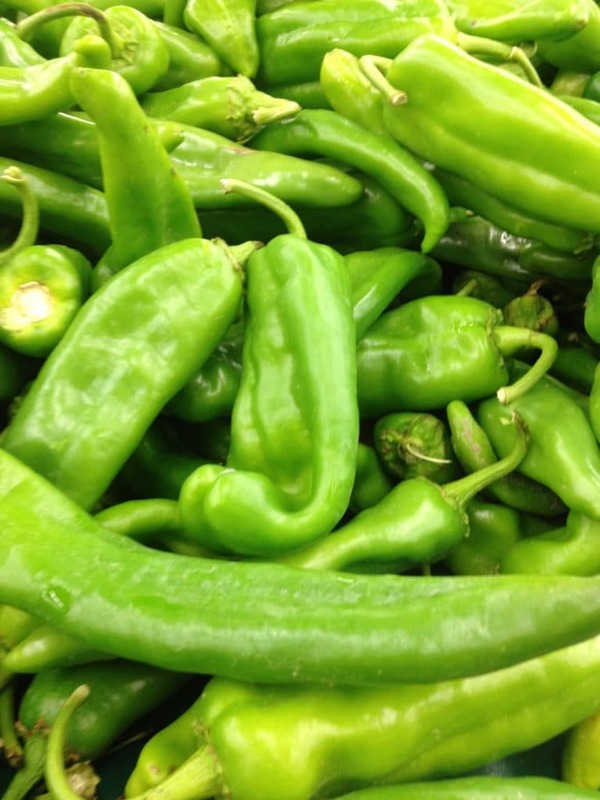 I wanted to make Chiles Rellenos the other day, but didn’t want anything deep fried. I also wanted to try using ground oats instead of breadcrumbs for a gluten free meatball. 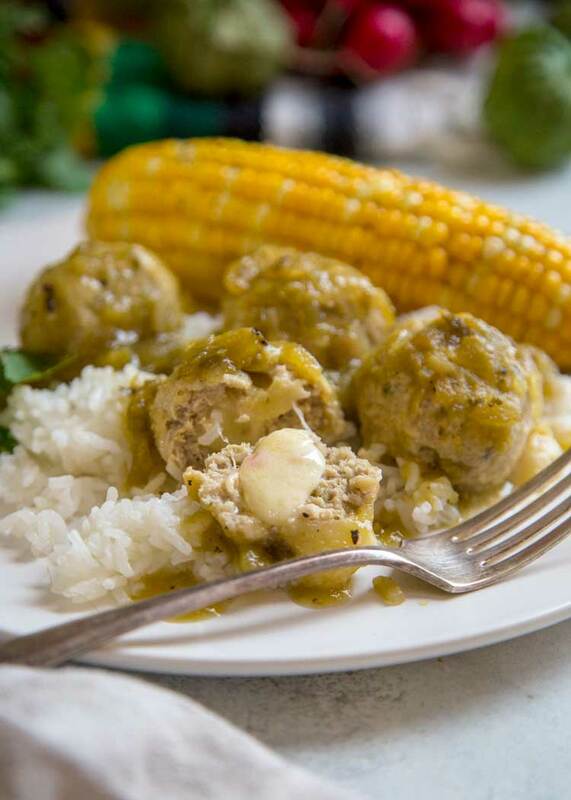 So I merged the ideas with ground turkey to make these Stuffed Green Chili Meatballs in Tomatillo Sauce. 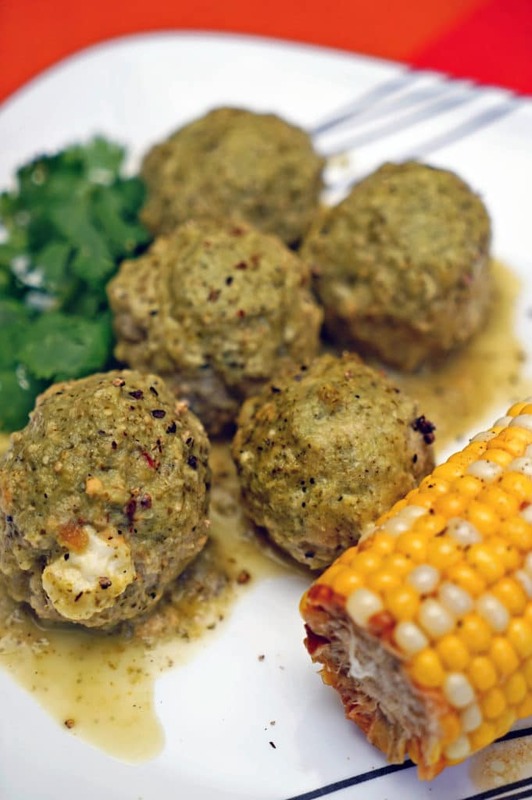 These stuffed meatballs ended up being fantastic and with some homemade tomatillo sauce drenched over and then baked, these were super moist, soft and extremely flavorful. 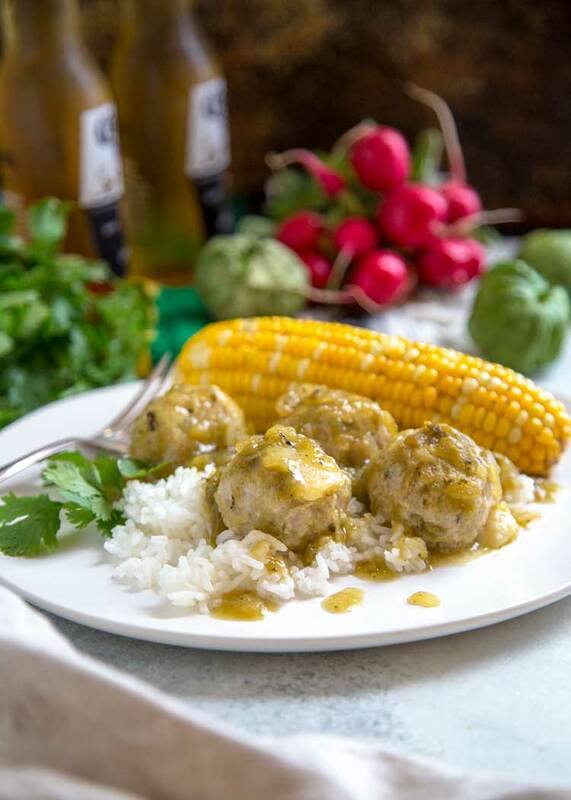 With the abundance of green chiles lately I was excited to incorporate them, all roasted and chopped, into the meatball itself. I grilled them on the BBQ, removed the stems, and seeds and chopped them up. Allow them to cool down before mixing in the ground turkey. Feel free to used canned if you prefer. While I was doing that I preheated the oven to 450°F. In a mixing bowl add the ground turkey, green chilies, ground oats (or bread crumbs), egg, Mexican oregano, garlic powder, salt and cumin. 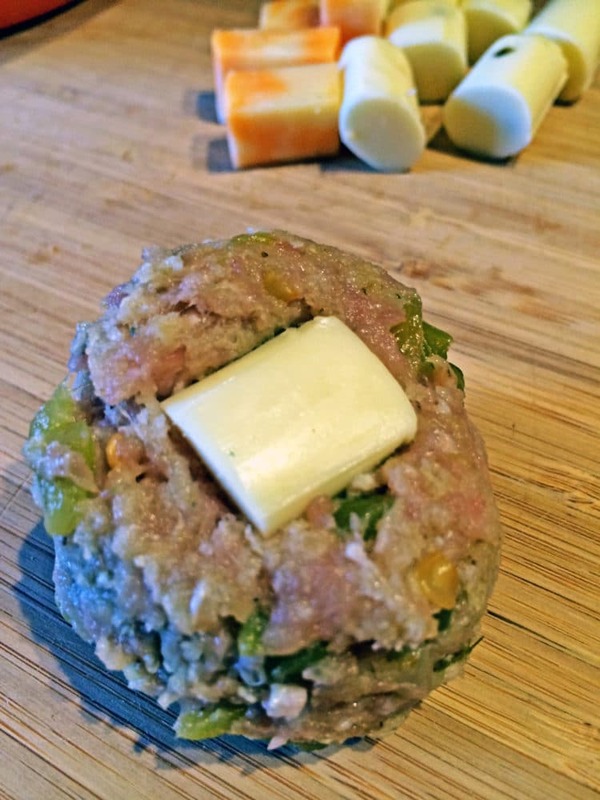 I had some string cheese sticks for snacking in the refrigerator and chopped them into small 1 inch chunks and inserted them into the meatball. They turned out pretty damn good. 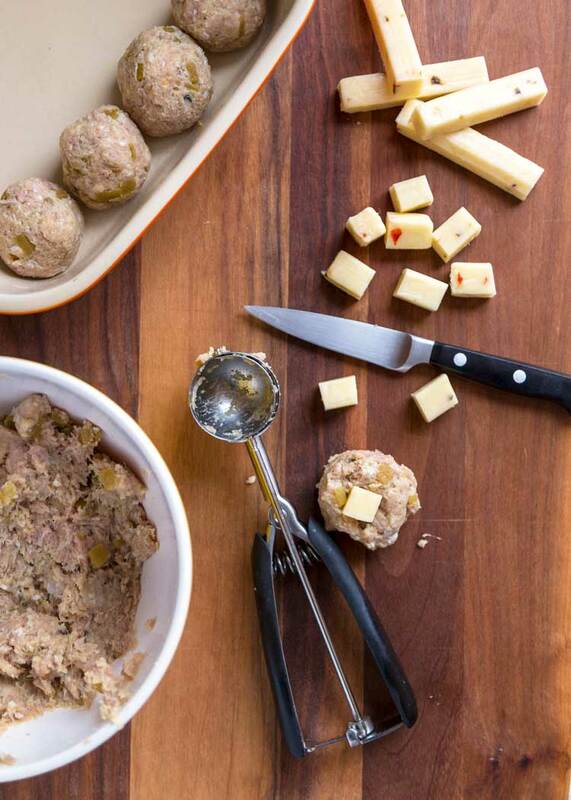 I used a medium sized cookie scoop (or ice cream scoop if you have it, too) to start the meatball off and pressed the chunk of cheese into the scoop of the turkey mixture. It helped in that the cheese didn’t poke out the other side as it did when I first tried these just in my hand. After wrapping the meat around the cheese, I popped it out of the scoop and rolled it into a smooth ball. This should make 16 meatballs. 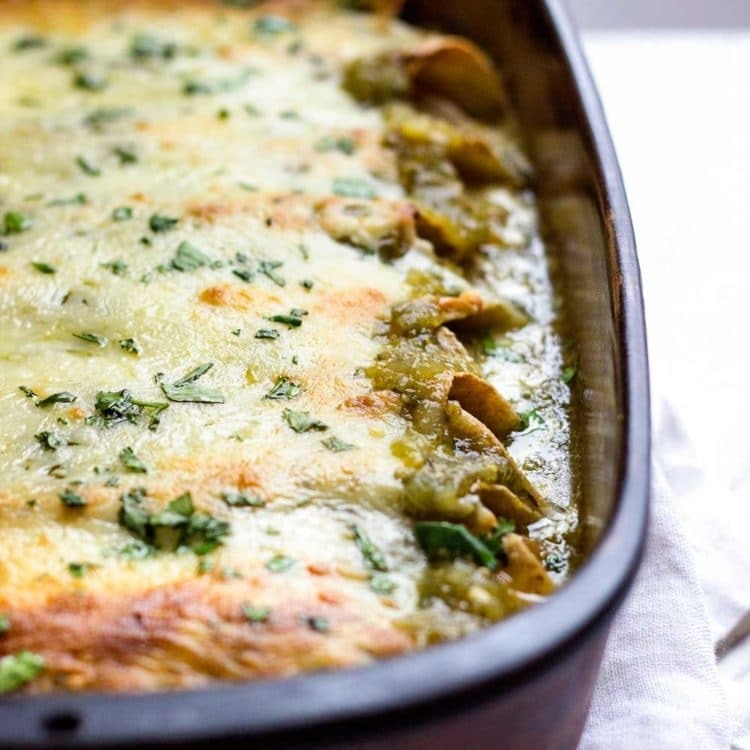 I had made a beautiful green chile and tomatillo sauce the previous day and then changed my mind mid recipe and went another direction, so this came in handy, but feel free to use store bought if you prefer. 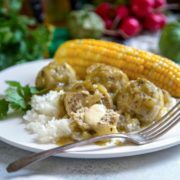 Here is my recipe for my Tomatillo Sauce, it really doesn’t take that long to make and is much better than store bought to me. 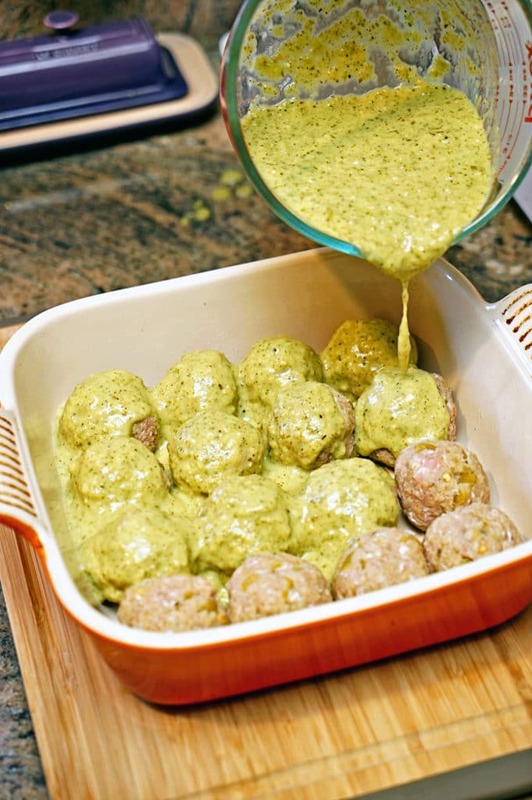 Place the cheese stuffed meatballs in a greased 9×9″ baking pan. 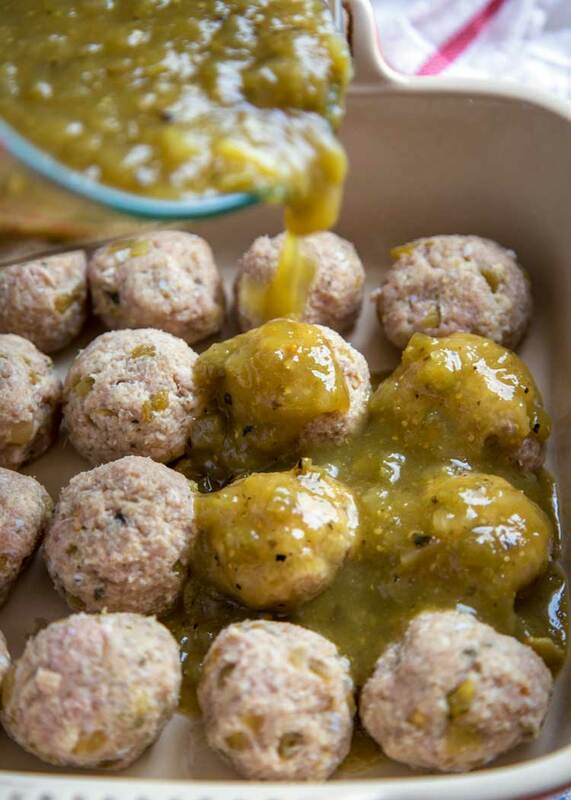 Pour the tomatillo sauce over the meatballs and then cover with aluminum foil to seal. 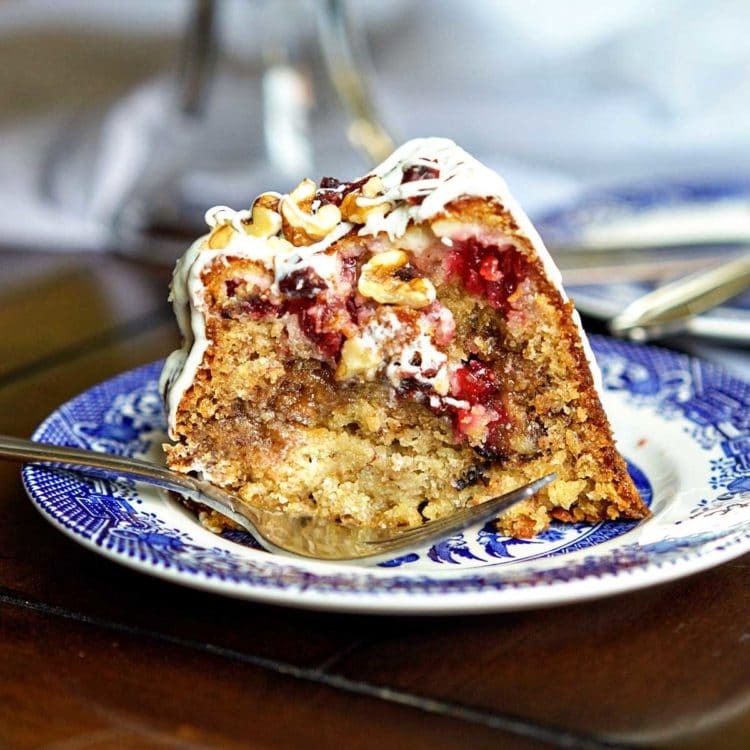 Reduce oven temperature to 350°F and bake for 30 minutes with the last 5 minutes uncovered. 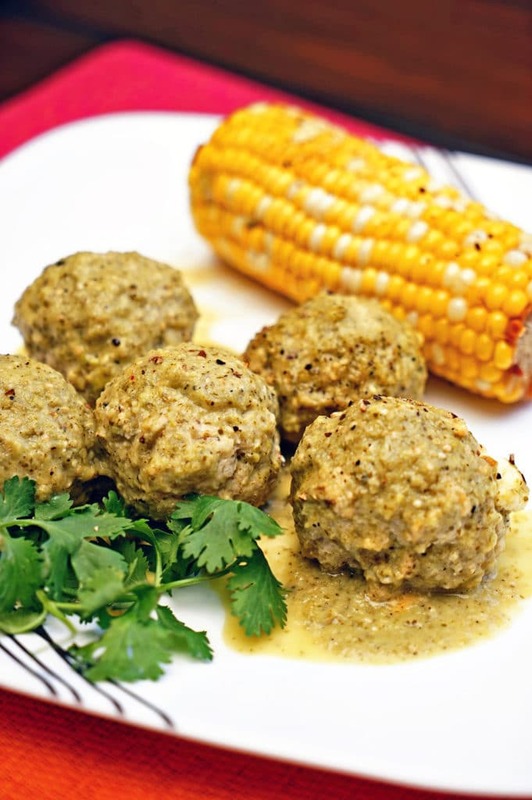 These Green Chile Meatballs were unbelievably moist, tender and so flavorful. 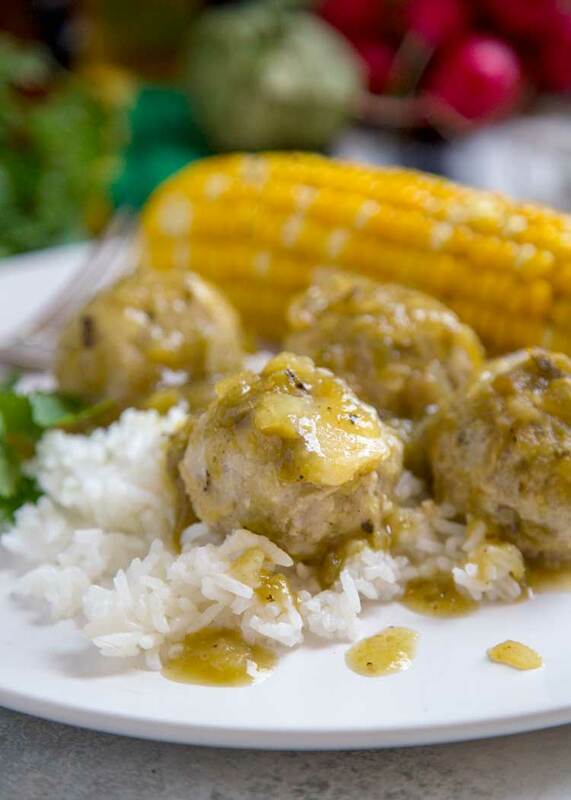 The spiced tomatillo sauce napped over each meatball was thick and had just a hint of spice. 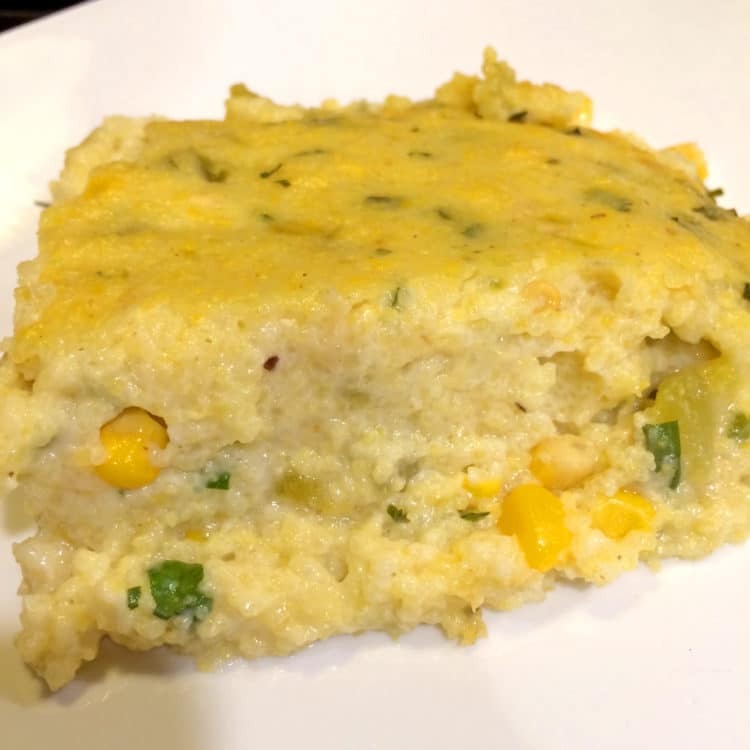 I served this with some fresh grilled corn on the cob and called it a night. Enjoy! 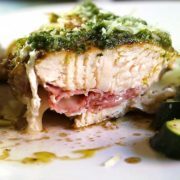 This recipe was previously posted on Kevin Is Cooking in March 2016 and has been updated with new photos and a video. 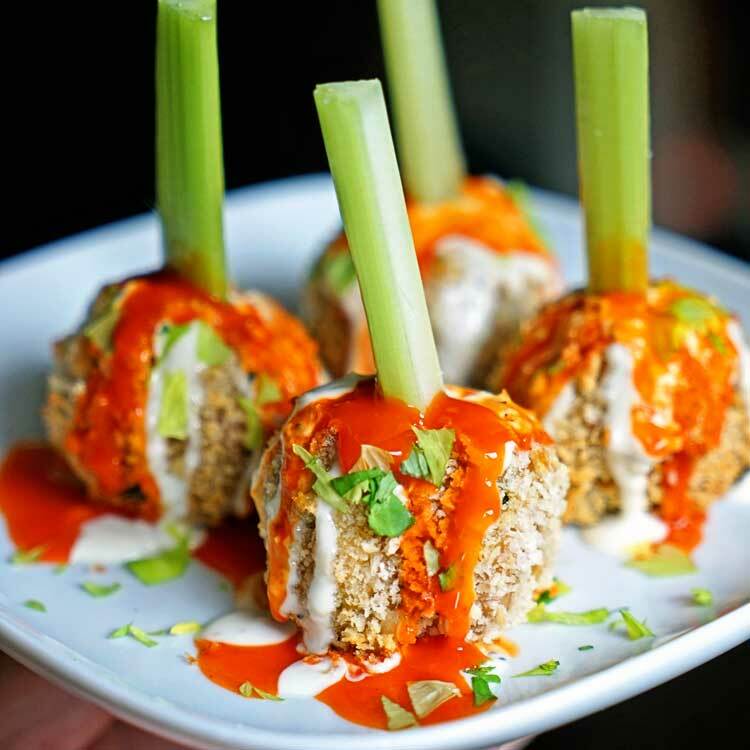 In a mixing bowl add the ground turkey, green chilies, ground oats (or bread crumbs), egg, Mexican oregano, garlic powder, salt and cumin. Mix thoroughly with your hands. Next, cut 4 cheese sticks into 16 cubes, about 1/2 inch in size. Press each cheese cube into the scoop with turkey mixture and then mold the meat mixture around to completely cover the cheese cube. 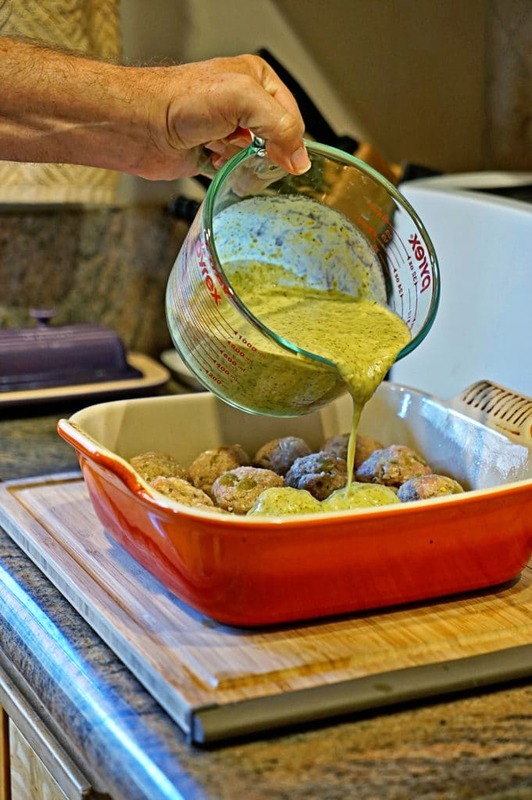 Place the meatballs in a greased 9x9" baking pan. 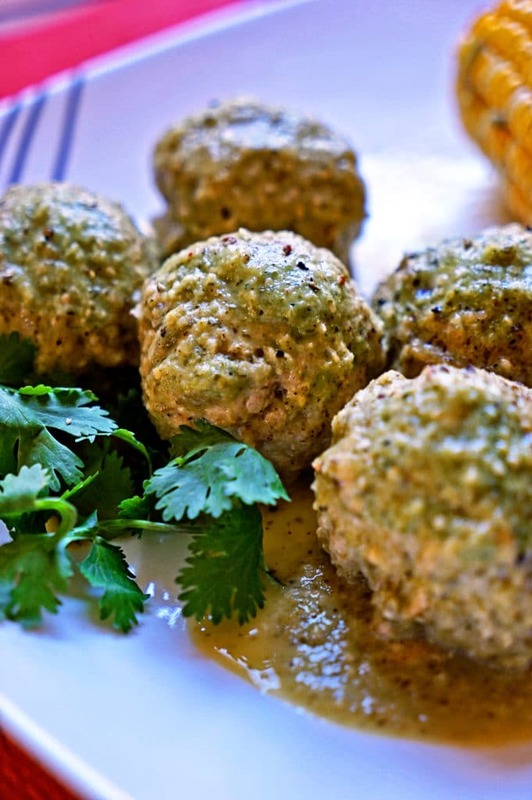 Pour the tomatillo sauce over the meatballs and then cover with aluminum foil to seal. 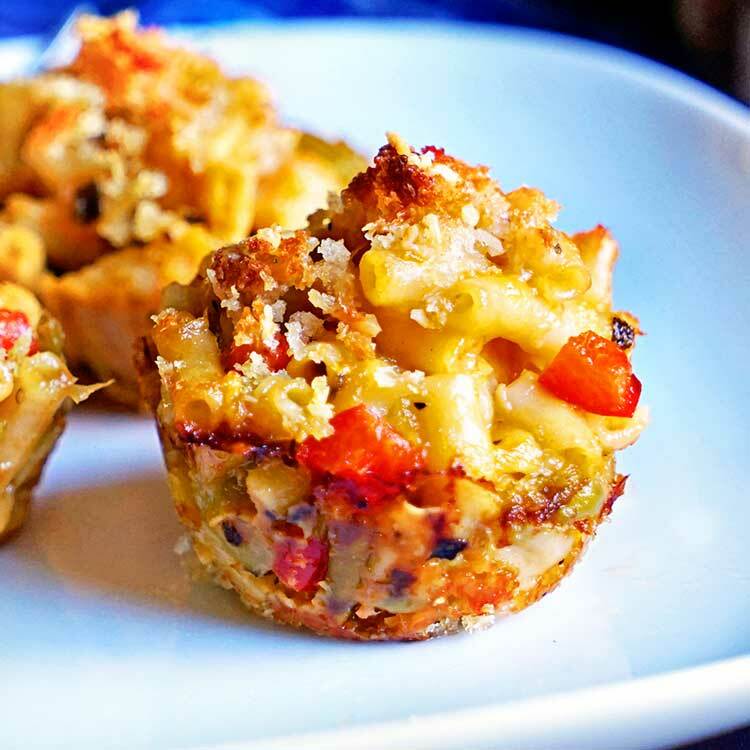 Reduce oven temperature to 350°F and bake for 30 minutes with the last 5 minutes uncovered. 1. cut 4 cheese sticks into 16 cubes, about 1/2 inch in size. Press each cheese cube into the scoop with turkey mixture and then mold the meat mixture around to completely cover the cheese cube. The cheese I get is a 16 oz bag, like string cheese sticks. I like to use Pepper Jack Cheese ones. If you can't find them, use a block of cheese and cut into 1/2" cubes. Save remaining cheese sticks for other use. I’ve made these twice now; once with homemade salsa and once with jarred. Both turned out spectacular! I absolutely love that I can plop them in the oven and have them come out perfect! My husband LOVES these and makes nom-nom noises all through the meal! Sad to read you’re having difficulties, you’re the first to mention that Desiree. Could it be altitude, oven not correct temperature? Maybe try putting the meatballs in the oven uncovered and not sauced at the 450°F temp and cook 10 minutes, then sauce and drop temp as instructed and follow remaining instructions? Let me know! So much flavor Kevin! These look awesome! These look just amazing. I like that you used the oats – i’ve never tried that before. I’ll have to give it a shot. And I LOVE a fresh tomatillo sauce!! 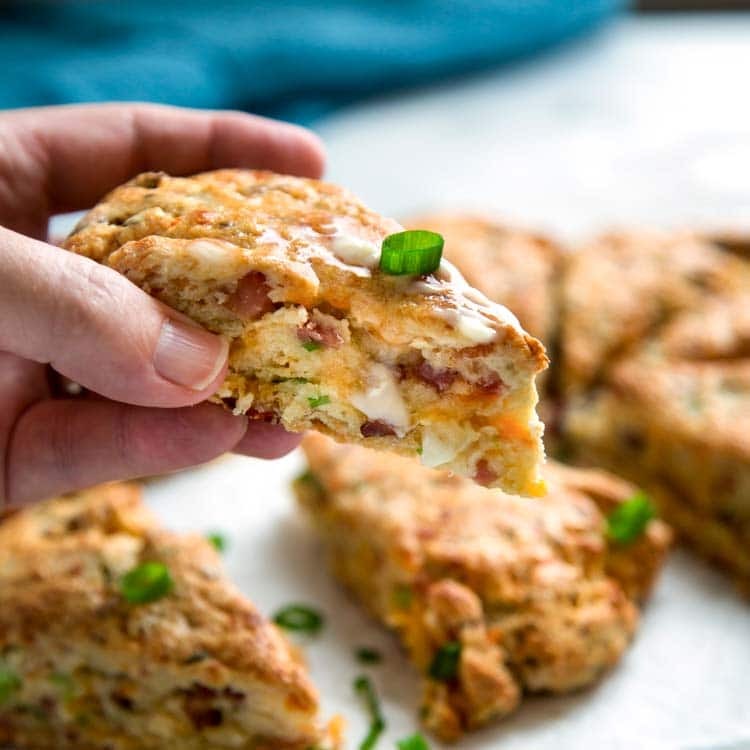 Plus cheese…..I’ve totally got to make these. I’m always thinking of ways my friend Mary, who is gluten free, can enjoy too. Thanks Danielle! 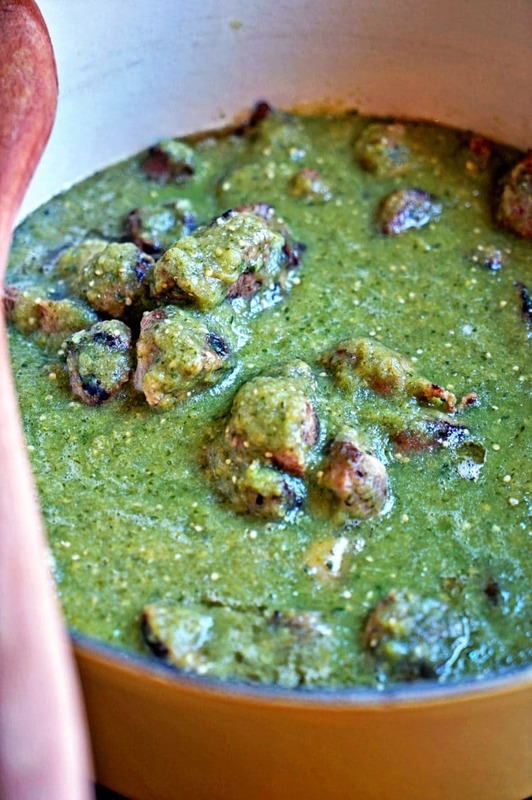 You gotta love a good tomatillo sauce. These looks GREAT, Kevin. Looking forward to making them again.